Alexandria York has to make a choice—to forgive Avalon’s lies or walk away. Their bond not only flows through blood but now runs soul deep. The choice to stay with the man she loves could cost them both dearly. 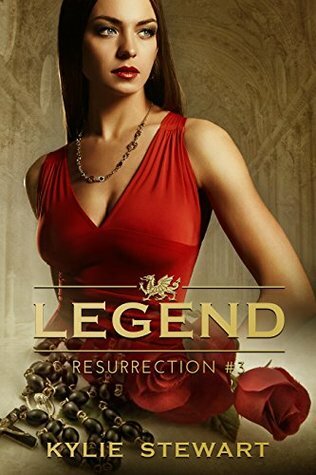 Resurrection is the third book in the Legend Series by Kylie Stewart. A fast-paced sensual book, I was kept glued to the book. This is not a standalone book. You need to read Set in Stone and The Duke’s Curse before starting Resurrection. If you don’t you will be very confused by relationships and situations in this book. Resurrection picks up after the events at the end of The Duke’s Curse. Alexandria is aware of what Avalon did to her and oh man, she isn’t happy about it. She is super ticked off and refuses to even hear Avalon’s explanation for what happened. Which I didn’t blame her because I would have been very angry as she was if that was me. She ends up forgiving him and they both realize that there is more going on than what they think. Modred is plotting his revenge on Avalon. Lancer makes a decision that reverberates throughout the book. But in the end, everything comes down to Alexandria, Avalon, and their love. I had put Resurrection down as a romance but it is so much more. There is fantasy and action sprinkled throughout the book. What I liked is the turn to the mystical shortly before Avalon and Alexandria reconciled. That whole angle fascinated me and I can’t wait to see how it is going to play out in the other books. I loved Alexandria. She loved Avalon but what he did ripped her apart. I was thrilled when they got back together at the Eros and Psyche unveiling. She was so strong when going up against Modred on her own. I felt bad when the truth about where her parents worked and how they died was revealed. And the last scenes of the book, they were heart-wrenching. I was sobbing by the time I finished the book. I liked Avalon in this book. He came across as more human. I don’t know how to explain it but it seemed like he was more open in this book. I felt that in the last couple of books that he was a bit standoffish. It was because he was in so much pain and despair. He was happier in this book also….well until the events unfolded at the end. I do like the divinity angle on the marks on his arms and what John (aka Galahad) said they represented. Made me wonder what is in store for him in the other books. Modred was an evil, evil man. I didn’t like him in the other books but this book, he made me despise him. Which isn’t easy to do considering he is a fictional character. What he did to Lancer, under the guise that he was going to help him win Alexandria back, was deplorable. As was his hand in the events at the end of the book. Lancer, I felt bad for, unlike the other books. I felt bad for him because he felt that he had no other option but to subject himself to Modred’s corruption. He was so upset and jealous over Alexandria’s choice that he went to the person that he knew Avalon hated the most. What Modred did to him was unbelievable. I am hoping that John (Galahad) will be able to help Lancer in the next book. I liked that four of the Knights of the Round Table was introduced. Galahad, Percival, and Gawain. But what surprised me was that Tristan working for Modred. I was not expecting that considering that he helped Modred with Lancer’s corruption. I am hoping that the rest of the knights are revealed in book 3!! I was very shocked at the end of Resurrection. Actually shocked doesn’t cover the depth of my emotions. I was heartbroken, shocked, mad and a little hopeful. I can’t wait to read book 3. I need to find out what happens to Avalon and Alexandria. Resurrection is one of those books that you will not want to put down. This book has a plot that will keep you on the edge of your seat. It also features a love that goes beyond anything that I have read before. Be warned: You will need tissues while reading because you will burst out into tears during various parts of the book!! I would like to thank Kylie Stewart and TCK Publishing for allowing me to read and review Resurrection.